If you love to scrapbook you know how quickly you can accumulate lots of paper, especially size 12x12 paper, which it seems hardly any paper organizers are designed to accommodate. Using an organizer like the one pictured can help you get more pages done for your scrapbook more quickly, and with a lot less hassle, because you can find the piece of paper you want more quickly and easily. 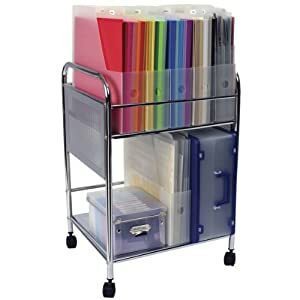 The paper holder trolley holds up to 2,000 sheets of 12x12 paper. To use this organizer though you actually need to also have the specially designed paper and sticker holders made by the same manufacturer. These are designed to store your paper vertically, meaning you are not piling paper on top of paper where you have to move stacks around to get to what you want. You can also use the bottom of the cart to hold additional scrapbooking supplies, such as scissors, paper punches, markers, glue and tape, etc. You can see even more craft organizer and storage product recommendations and ideas. Shop safe at Amazon and enjoy free shipping if you spend $25 or more on most items. Join in and write your own page! It's easy to do. How? Simply click here to return to craft organizer.